/well done BFP. I believe you are spot on about the reasons behind Prime Minister Thompson appointing his own people to the Clico board and not allowing the regulator to become involved. I agree, excellent story and analysis. Barbados doesn’t have elections financing laws does it? What a wild place when you get right down to it. Its like anything goes. And we remember the wrongs by the last BLP. “The DLP is quiet on that two”. If there were wrongs, the DLP would have found them out, now 18 months later. You scratch my back and I’ll scratch yours; pretty nice arrangement. The Bajan electorate are the losers. Appears the 2 parties are happy with this arrangement. You must agree MORAL BEHAVIOUR is a thing of the past for most governments and probably will get worse. Many of us look to the UK for guidance & leadership. We read both parties are involved in immoral behaviour. Those so-called politicians go into politics for themselves. They ‘string’ people along in order to achieve a privileged position and then abuse it. They dislike criticism, perhaps deluded in the fact that they are now ‘THERE”, makes them untouchable. BFP: You and I and many more are to blame; we put them “THERE”. Like you and I and many more wanted change. We got that change. Government in black countries are far too eager to accommodate them..
A lot of truth in the above post. Personally I feel ashamed of myself when I remember how excited I was on election night. polticians will say anything, absolutely anything, to get elected; and that once in power they will do and say anything to hold on to that power, and bleed the country dry if necessary. start putting up independents who are incorruptible and have’t been polluted by the old boys network. The track record of these people should be out there for all to see. I thought he was God. Hey! Hey! I only hope that the cricketers Benn and Gayle etc. got the millions promised in the last 20/20 match held in Antigua. What does it take to be a candidate? Could an independent person get enough votes to make a difference? Would there be trouble for my family? It is not a simple thing to be a candidate. LOL my brother would turn against me for breaking party rank. boredickey et al: there is a fascinating article in this month’s edition of Vanity Fair magazine entitled “The Pirate of The Caribbean” all about Stanford. Many interesting facts such as, he vanished after his fitness club in Texas went bankrupt and then he resurfaces later in Monserrat, of all places, to open his first bank. There is also information on his involvement in cricket and the 20/20 match. Vanity Fair magazine is accessible online. Jason you would be totally surprised to find out how few votes it would take to win by a moderate and honest third party candidate. Total transparency needed! What is wrong with you bajan bloggers? You’ll debate endlessly about trivialities, but this item that might play a part in the future of all bajans you’ll pass by lightly!! Oh, but they can be tocuhed. The question is ‘will they be’. Do you really think that the ‘pwoers that be’ wish to destabilise these little islands? A few little people, to them. Largely irrelevant. So, they are left to their own devices, as long as these little islands toe the line and cooperate when necessary. The important thing is that change came when it was necessary. The world over, elections are rarely won, mostly lost. Only in rare cases, are elections actually won by outstanding candidates. Even in Obama’s case, an outstanding gentleman, the Democrats had the assistance of the incumbent GOP’s crass, unsuitable and irrelevant policies, to assist in the victory. As such, the important factor is removing any arrogance, excess power and stagnation, that derives from too long a political reign. DLP and BLP preach “transparency” but both hide their campaign donations and expenses. This country needs campaign financing laws just like it needs integrity laws and FOI. No chance with this bunch. DLP or BLP. WE NEED A NEW PARTY DEDICATED TO CLEANING UP THIS MESS WITH LAWS. Such a fowl stench coming from these two long serving parties. Thompson whom we all thought would be a prodigal son is turning out to be a real wolf in sheep’s clothing. To think that I honestly believe that he of all people would learn from history’s past and execute commonsense in running the affairs of this country, has let his monkey tail exposed. The CLICO affair stands to bury the Democratic Labour Party. At the worse point of our political system, where scandals, alleges of corruption and ministers getting to big for the boots presented the current administration with the perfect opportunity to display a degree of integrity and transparency to the people, this administration has allow themselves to be tarnish by speculation, rumour mongering and lies. Many are of the belief that a party in opposition for 14 years is hungry to tap into the resources of wealth for their own personal accumulation. The last administration did it so there is the chant of “why not we”. The Thompson administration so seemingly are allowing themselves to fall victim to the very thing that ousted the Arthur administration. IF this continue the assurance of victory in the next general election will be thwarted. It makes no sense providing negative fuel that could put the party and himself right out of office. The Barbados Labour Party have already done their wrecking and I doubt if Mia and her crew, particularly with the huge question mark hanging over corrupt heads of this party, can bounce back to win the people’s confidence. But bajans are forgetful people and Mia just have to come straight up and she might just be our first female premiere. It is obvious that there is no great divide between these two parties except that which we are being led to believe. What will happen in the next general election will have to be something short of spectacular if not miraculous as the views of many have placed politicians in a very corrupt and deceitful light. Time I believe will be deciding factor. First it was BERNIE MADOFF – who “made of” (LOL) with $50 Billion in other people’s money including duped celebrities like Steven Spielberg and other so-called notables, where his PONZI scheme was circulated to investors around the world as far away as Australia, offering a viable high-yield investment (see GREATER FOOL’s Theory) and the money was then used by his wife and his cronies to prop up a lifestyle of the rich and infamous. What is becoming increasingly laughable in the 21st century is the level of GREED, AVARICE, CORRUPTION and the INSIDIOUS machinations on the part of those who want to get rich at any cost, forgetting that sooner or later “karma” will catch up with you. In the case of Allen Stanford or should I be gracious enough in saying “SIR” (who gives a flying-fish anyway) – but for all intents and purposes “sir” is really an oxymoron as it would seem that all these so-called “knights of the realm” including those here in the United Kingdom are guilty of such gross breaches of the code of social morality arguing vehemently that they have done nothing wrong. Could these idiots be so divorced from reality? Or are they so warped mentally that the lines between right and wrong is so blatantly blurred that even wrong doing is justifiable? Do they not recognize how they have literally undermined the structural integrity of the system for which they have been mandated to represent given public trust and confidence? This “dis”-honorable behaviour by men who ought to know better merely gives more ammunition to those “underworld vermin” in our societies further excuses to justify their own treachery, malevolence and rapaciousness. Politicians across the board have gone stark raving mad it would seem given the level of diabolical machinations they exhibit especially when it comes to wanton excessive misuse and abuse of the public purse. Barbados apparently has not been exempt! But why am I surprised given the fact that a culture of “I can do whatever I like” has always been the mantra and governing ethos of the political classes and is now an entrenched social norm where ministers (“honorable gentlemen” – as they are called) are granted pretty much license to steal, misappropriate, embezzle and cover up their shenanigans without fear of reciprocity, censure or jail-time. The British political establishment is currently in the throes (after 300 years of parliamentary democracy) an advancing “barbarian” revolution of uncommon “sorts” which will result in a metamorphosized vacuous conundrum where fascists, extremist groups and radical independents will come to hold the sway of political power in the coming years but what is so ominous is given the fact that between 1939 and 1945, men and women (including West Indians) fought, bled and died for the liberation of Europe, to free this “glorious land” from the tentacles of fascists NAZI oppressive scum – one would surely assume that the possibilities of such a socio-political and historical mirage would NEVER again be revisited upon a people who had been so deeply scared by the sophistries of war, oppression, bigotry and human extermination – now shows that such a rude and poignant lesson of history is likely to be repeated (if not averted) because of this clear and present danger of distrust and the ominously looming specter of nationalization that could very well be our undoing. As the ‘ole maxim goes, ” those who refuse to learn the lessons of the past are doomed to repeat the same mistakes in the future”…. My hope is that the current government of Barbados will adopt and implement its manifesto promises to its people as we too are not exempt from insurrectionists rogue elements (remember Sydney Burnett-Alleyne). As a Bajan with probably the largest count of family members on the island of Barbados, my concern is the future of my posterity and the ultimate legacy which will be left for those who are now in kindergarden and primary school who will have the arduous task to fixing and cleaning up the mess we leave behind. The 21st century must not be riddled and rife with the politics of a bygone era, as there is no place for this in a past-modern society. If men want to subject us to the tyranny of the past by continuing to burden us with subterfuge, lies and lack of accountability – the end result will be REVOLUTION!!! British parliamentary democracy has never seen such a silent revolution in its 300 year process as it is seeing today. The sad irony is that the vacuum that is left is being filled by RACISTS, BIGOTS and FASCISTS SCUM!!! Let this be a lesson to those in Barbados and elsewhere who think because they wield power for a short season that we the people will NOT do the unthinkable if it means safeguarding the interests of our families and those we love. We are calling on our religious, civic, institutional and political leaders to open up the PROCESS to greater transparency, accountability and integrity for the sake of future generations. We can no longer afford to be riddled with the guilt and miasma of a broken society where distrust, crime and social degradation are the chains which enslave us. There CANNOT be one set of laws for one group of people and another set for the political and elitist classes within Barbadian society. This is totally unacceptable in this day and age!!! Let me remind those who currently wield political, religious and economic power in my country and are all currently drinking from the sacred “trough” – the handwriting is on the wall. Remember the words to Belshazzar the King of Babylon “MENE, MENE, TEKEL, PARSIN”…. Let’s start clamouring now for foreign observers at our next general election. Both parties have stooped so low that there is a real possibility that the next election might be the first in Barbados of an unfree and unfair election! Nice piece Terrence. Lack of vision coupled with greed is a recipe for certain disaster and those two weak points epitomize our politicians here in the c’bean. Are you related to Dr Alfred Blackett by any chance. 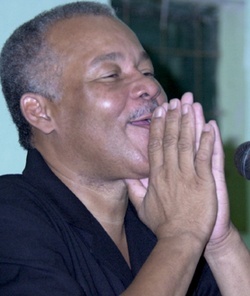 He was my headmaster at the Antigua Grammar School for a couple of years and hailed from Barbados. However I had difficulty reading and understanding the paragraph starting – “The British political establishment……”, until I realilzed that it was one long sentence! Duh? You be living up there and should know better than to massacre the language. In short, I guess that sentence to be about 150 words, should have been at least ten sentences. I must say, however, that I like what is happening with the political resignations up there in Ole Blighty. Cant see that happening in Bim anytime soon. Yes I am Dr. Blackett’s nephew. I also went to school at the AGS and lived with Dr. Blackett while he was Headmaster of the school. But when you are “PISSED OFF” – it happens to the best of us…. As a BRIT, who ought to speak the QUEEN’s English, I should know better, right? I will try to do better next time and not be so riled up…. This is starting to make sense. Allen Stanford is listed as one of two owners of Elandia according to SEC filing. It appears that Allen Stanford has a merry band of thieves that operate in true “Stanford form”. According to a SEC filing, Allen Stanford forced Sydney Trip Camper to resign from Elandia a few years back when a money deal went bad. This story is getting better by the minute. I didn’t realize just how far back Stanford goes. The Elandia SEC filing shows him as major shareholder with Kelton. Petty minions like Sydney Donald “Trip” Camper are part of this network of scammers. According to the SEC filing, Trip Camper was forced to resign from Elandia by Stanford himself a few years back because a deal went bad with a certain Mr. Ahkoy (see link below to see letter to board of directors). As any good con would do, Mr. Camper immediately moved on to another state, to his next victim – a privately owned “OTC” company. According to a VERY reliable source: After a promise to take the company public, a free trip to London with his friends, a company Amex Credit Card, and thousands of dollars later, Mr. Camper managed to illegally get shares of the company stock signed over to himself and his partner in crime, Ed Berkhof. Eventually they performed a hostile takeover that was so illegal that only now do I understand the big picture and the history of their PONZI schemes – Sir Allen Stanford! Their pattern is to use other people’s money to attract more loans, etc. Because they’re actually using this loan money to pay themselves and their creditors, it caught up to them – finally! 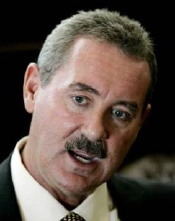 Well Sir Allen Stanford is now in the hands of the FBI and I can’t wait to see the way this story ends. I’m sure there will be plenty of finger pointing so I think I’ll get some popcorn and watch the show. Bad boys bad boys, whatchu gonna do, whatchu gonna do when they come for you!!!!! Interesting links below. Apparently Stanford is finding the jail he is in is too hot and he wants to relocate. ENOUGH IS ENOUGH!!!! A recent article states that “FMC is adding SMS to the company fold”. This is nothing but MORE name-dropping and empty technology dribble to form ANOTHER “shell” holding company for Ed Berkhof. Who does he think he is? Allen Stanford? Ed Berkhof and his previous co-conspirator, Sidney D. “Trip” Camper used name dropping, donations to St. Jude’s, and falsified tax documents to gain trust and get private investors to hand over thousands of dollars in cash, trips to England, and ultimately control of their company. Ed berkhof is NOT a president or COO of anything – Ed Berkhof is a third rate bass player looking for another victim to give him money so he can pay his creditors = PONZI. SEC files state that Sidney Trip Camper was fired from Elandia by Allen Stanford when the Ahkoy family’s business fell victim to investment fraud. Before the ink was dry on his resignation letter, Trip Camper and Ed Berkhof were already busy ruining ANOTHER company – in Los Angeles. Trip Camper and Ed Berkhof illegally signed over company stock to themselves and eventually performed a hostile takeover and ruined an honest and profitable company. The FBI has nabbed Allen Stanford and is now looking for other schemers in his network like Sidney D. Trip Camper and Ed Berkhof.